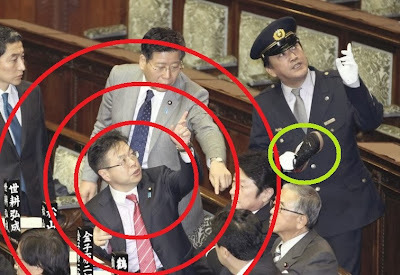 "During the preparations for the final vote on the Special Secrets Protection Act, an onlooker in the gallery of the House of Councillors took off his shoes and threw them into the Diet members' seats, hitting a legislator." "The legislator he hit was Seko Hiroshige." "Hmmm...that does not make it any less wrong, but it does show the man had excellent aim." For an account of the incident - Link - J.
Seko Hiroshige is a Shisaku favorite. For more posts on him and his position in the political world, click on the tag below.